Everybody wants cheap stock photos. Professional images that you can use in your projects without spending much money are a very valuable resource. And you can get them under different buying models, according to your needs. Stock photos on demand is one of them, a flexible and no-strings-attached system to buy Royalty Free stock photos cheap. This is a very simple and straight-forward method, where you pay only for the images you want to use, with no extra charges nor further fees involved. Although most stock agencies offering this option establish a minimum purchase requirement, this is usually a very small upfront payment, and they all include discounts for larger amount of images. Do you want to buy stock photos paying as you go? Here you'll learn where to buy them at the best prices, and with the best conditions. Read on! If you are unsure of whether to go for a subscription or on demand buying, don't miss our Credits vs. Subscriptions guiding article! How to Buy Photos On Demand? With Credits: Credits are a fictional currency invented by stock photo companies, and each agency sets the value for theirs. What they do is to price the images individually in credits, and then sell you credit packs that you must pay upfront and further use to buy images. The smallest credit pack is obviously the minimum purchase, and often it lets you get more than one image. The larger the credit pack you buy, the less each credit costs, and therefore the cheaper the images are. With image packs: In this case, the photos do not have an individual price per se. The agency sells you image download packs that you pay upfront and then use to get the images you want. The price of each download depends on how big the pack is, and obviously the bigger the pack, the cheaper the images. To learn more about these options, check our Credits vs. Subscriptions article. Where to Buy Stock Photos On Demand? Shutterstock is one of the top stock photo agencies in the market, well-known for having the largest Royalty Free photo library with over 100 Million images, for their very cheap prices, and for their advanced technology. Pioneers of the stock photo subscription, Shutterstock also offers image packs to buy on demand. As you see, the bigger the image pack is, the cheaper each photo will cost you. These packs are valid for one year after purchase date, and they are cumulative: you can buy as many image packs as you want, simultaneously or over time. Image packs let you download any kind of photo, vector or illustration, in any size and resolution available. All images come with their Standard Royalty Free license, allowing multiple different uses including those with commercial purpose, with no time limitations. If you don't want to sign up for one of Shutterstock's popular subscriptions yet, image packs are a great way to get high quality images at affordable prices, with no strings attached. Get your Shutterstock Images today! iStock is a well-known and reputable stock photo agency (previously known as iStockphoto). Its credited as the first “microstock” agency (selling Royalty Free images cheap on the web), and it's famous for their highly curated library with millions of assets, and their affordable prices. Along with subscriptions, they work with a credits system to offer images on demand. iStock's images are divided into two main collections, and priced accordingly. Essentials collection hosts millions of high res images for everyday needs, and are the cheapest. Signature collection includes millions of exclusive, high-value images, that you will only find at iStock, and which are priced slightly higher.All iStock images are Royalty Free, and suitable for commercial, personal or editorial projects. As we said, iStock uses a credit system: their images are priced individually in credits, and they offer credit packs that you must pay upfront and then use to download files of your choice. iStock's credit packs start at 3 credits for $12, and go all the way up to 300 credits for $2400, with a lot of size options in between. This means individual credit price ranges from $8 to $11 depending on the pack you buy. As it's clearly shown, with a bigger credit pack, each image will cost you less. You can buy as many credit packs as you want, simultaneously or over time. And there's one great plus in this system: iStock credits never expire. As long as you log in to your account at least once a year after the purchase date, all credits you have will remain active and ready to be used. This gives you greater flexibility than any other offer, as you can stock yourself up with credits and use them whenever you want. As you see, buying photos on demand at iStock has several advantages if you don't want to commit to a monthly download limit and monthly payments. Get your iStock credits and download images whenever you want! Adobe Stock is a stock photo service by the design software giant Adobe. With over 60 Million stock photos, vectors and illustrations, this service's core value is in its full integration into Adobe's Creative Cloud platform, which lets you access, buy and apply images to your designs directly from your favorite designing apps. Besides different subscription plans, they include an option to buy images on demand. This price corresponds to images on their regular collection, under Standard Royalty Free license –which lets you use them in various commercial, personal and editorial projects–, and in any size and resolution available. Again, the value in Adobe Stock is greater for Creative Cloud users. You can launch, surf, search, test edit, license and apply images from their stock library into your work, without ever leaving your app's interface. This saves you time and effort, and at a very reasonable price. If you want to exploit the benefits in having a huge stock imagery collection right into your design app, but you don't want to sign up for monthly plans, this is a good deal for you. 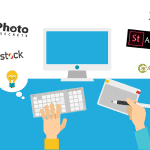 Get your Adobe Stock images and start designing! Depositphotos is a well established stock photo agency with many years in business. They have a large catalog with over 50 Million Royalty Free photos, vectors and illustrations, and multiple buying options with very affordable prices. Among them they have image packs to buy on demand. Like this, you can get images without any further payment commitments, and paying only for the amount you will use, for as little as $2,99 per photo. This includes images in any size and resolution, and under Standard Royalty Free license, which enables usage in different projects, including commercial use, with very little restrictions. If you want to buy Royalty Free images, paying as you go, this is certainly a good deal in cheap stock photos. Get your Depositphotos Image Pack now! Getty Images is one of the largest and most renowned stock photography companies in the world. This agency has been around for decades, and it's famous for their gigantic library and many dedicated collections, and particularly their Editorial content. They are a more traditional company and work primarily with Rights Managed licenses (much more expensive), but they also have a very large selection of Royalty Free images, and now they also have a very convenient way to buy them on demand, with Ultrapacks. As you would quickly notice, these prices are much higher than other stock photo agencies'. But the level of quality, curation, variety, exclusivity and reputability of Getty Images' content may well worth it for some buyers. Ultrapacks let you save up to 30% from regular image price, and that can mean thousands of dollars in savings. Images you download with Ultrapacks come with a custom license, enabling you to use them in commercial projects, and including some bonus rights that normally come as Extended licenses in other agencies. The best? Ultrapacks never expire: as long as you log in to your account once a year after buying them, all your Ultrapack downloads remain active. Plus, you can buy as many Ultrapacks, same or different, whenever you want, and use them at your discretion. If you want the kind of premium content and reliability that Getty Images has to offer, and you can afford their prices, this is a great option to save some money and buy without further commitments. Get your Getty Images Ultrapack today! Why Buying Photos On Demand? One thing to keep in mind about this system is that, in most cases, the prices per image are a bit higher than with other options, particularly than stock photo subscriptions. Of course, when reading this it would be logical to wonder, why to buy stock photos on demand then? There are different case scenarios where this turns out to be a better option than getting a stock photo subscription or choosing other similar options. When you only need a handful of images every now and then, or even a few images only once. In this case, getting a subscription makes no sense, as you won't have use for the hundreds of downloads you would receive every month, and you'd end up losing out in price. When you want to test the waters with a stock agency, or with stock photos in general. If you are not sure how the images of a certain agency would work for your intended use, or you just don't know if stock photos are quite what you need, signing up for a monthly subscription might feel a bit too risky. Buying on demand you can spend only a little in a couple images, and test how they do in your projects. When you just don't like to assume long-term commitments with a stock agency. Some people just don't like to sign up for monthly payments, even when it means getting better prices for photos. If this is your case, then on demand buying is best for you. Keep in mind that while prices will almost always be a bit higher than that of subscriptions, if you buy large amount of downloads in advance you can get a considerable discount in the price per image. When you need a more flexible download limit/time frame. At most stock agencies, subscriptions come with monthly download limits, and not all of them allow roll-over of unused downloads. This means you only have one month to consume all your downloads, or you lose them. In most companies, images on demand are valid to download for up to one year after purchase date, so if you need a flexible time frame to use up your images, this is a better choice. So now you know, there are ways to buy Royalty Free photos cheap, without having to sign up for monthly payments nor deal with monthly download limits. Buying on demand is a very good option for you to get high quality images to use in your designs, controlling exactly how much you spend, and when. Are you going to buy stock photos on demand? Let us know how the method works for you!